The Syrian crisis, which entered its fifth year in March 2015, continues to weigh on the politics and economy of Lebanon. The parliament still has not managed to elect a head of state since May 2014; its mandate was extended twice in two years, for the first time since the end of the civil war (1975-1990). The cabinet, the last stronghold of power, has been weakened by internal divisions and seems to be playing all its cards to avoid a crash. Economically, the picture is no brighter. Though a slight rebound was observed in 2014, with growth estimated at 2 percent, compared with 1.5 percent in 2013, according to the International Monetary Fund (IMF), and 0.9 percent according to the World Bank, the country still lags behind the growth rates of more than 8 percent on the eve of the Syrian conflict. According to the IMF, growth will stabilize at this lower level during the next two years and will not reach 3 percent before 2017. Debt continued to grow, reaching almost $70 billion, or about 145 percent of GDP, one of the highest ratios in the world, while unemployment, poverty, and inequality continued to increase. With more than 1.6 million Syrian refugees living in the country, according to various estimates —i.e., more than one-third of the local population—Lebanon, which is already host to nearly 400,000 Palestinian refugees, is facing one of the toughest humanitarian, social, and economic challenges in its history. This demographic weight leads to competition in the labour market and to social dumping. According to a survey conducted in 2013 by the Economic and Social Commission for Western Asia of the United Nations (ESCWA), 71 percent of Syrian refugees live in poverty, while three-quarters of them have no job qualifications. A loss of 14 percent of wages among less-skilled workers had already been noted by that time. This worsens an already fragile labour market in Lebanon. Between 2005 and 2009, Lebanon created 3800 jobs per year, according to the World Bank, absorbing only one-sixth of the 22,000 Lebanese who enter the market annually. This growing unemployment has also increased the poverty rate. It is believed that 170,000 Lebanese (about four percent of the population) have fallen under the poverty threshold (of less than one dollar per day) over the past years, according to the World Bank. This is in addition to about one million Lebanese (25 percent of the population) who were already living in poverty. The impact of the huge number of refugees is also felt in the quality of the already poor services provided by the state; about 57 percent of public school students are now Syrians, and refugees consume more than 26 million cubic metres of water (seven percent of total Lebanese consumption) and about 300 megawatts (MW) of electric power . Before the Syrian crisis emerged, Lebanon was already experiencing an annual shortage of 700 MW, with a local production of 1500 MW, against a demand of 2200 MW. The pressure is also felt in healthcare. Public and private hospitals have been overwhelmed with refugees since 2011. In 2013, about 40 percent of emergency and primary-care services went to Syrian refugees. The situation has changed little since then. This demographic pressure is translated into a financial one; according to the World Bank, public spending increased by $1 billion over the period 2012-2014 , while the shortfall in revenues was estimated at $1.1 billion and overall losses related to the crisis totalled $7.5 billion during this period. 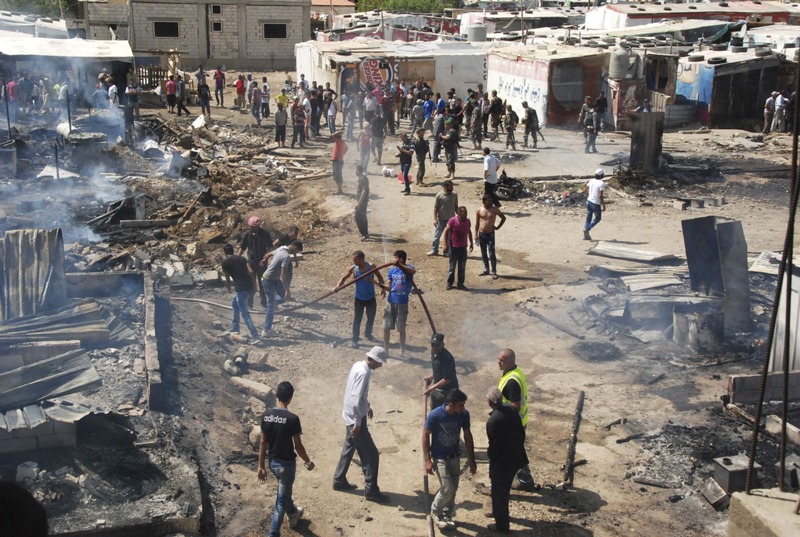 Rising rents or growing unemployment have so far caused no major incidents, but there is a growing hostility; some isolated incidents have occurred in the Bekaa Valley over the last 12 months—including a case of arson in a camp—but these were related more to Sunni-Shiite tensions than to socio-economic factors. The financial and economic impact related solely to refugees is estimated by the central bank at $4.5 billion every year. In a recent statement, Riad Salameh, the governor of the Banque du Liban, said, based on a study by the World Bank, that Syrian refugees impose a direct cost of about $1 billion a year and an indirect cost of $3.5 billion. He said that improvement in internal trade and consumption does not compensate for the costs incurred. Syrian refugees have, however, also contributed to the Lebanese economy, according to some economists. As part of a project with the United Nations Programme for Development (UNDP), the Lebanese economist Kamal Hamdan estimated that the demand of the Syrian refugees alone generated 1.3 percent growth in 2014, that is, more than half of the two percent estimated by the IMF. The Syrian crisis has indirectly driven activity in the port of Beirut, as a result of the drastic decrease in activity in the Syrian ports of Tartous and Latakia. The number of containers increased by eight percent in both 2013 and 2014. Analysts fear Lebanon will, in the longer term, face a scenario similar to the Palestinian case, in which a majority of refugees will remain more than a half century after their forced displacement. The French specialist, Fabrice Balanche, recently said that Lebanon must be prepared to maintain at least one million Syrians on its territory, if Bashar al-Assad remains in power. The IMF, in its most recent report on Lebanon, advanced the hypothesis of a gradual return of refugees beginning in 2016, saying, however, that 30 percent of Syrian refugees will still remain in Lebanon in 2019. According to this scenario and considering growth averaging 3.7 percent per year, unemployment would drop to only about 18 percent, compared with 20 percent at present. Even with stronger growth, of about five percent, unemployment would remain above 15 percent. Beyond the economic impact, the eventual naturalization of Syrian refugees in the longer term would destabilize the fragile sectarian balance in Lebanon, making Sunnis—who currently comprise about 25 percent of the population (compared with the current 30 percent comprised by Shiites)—more important demographically. Given this situation, the Lebanese government decided early this year to begin regulating the labour market by requiring a work permit of Syrians. To renew their residence, refugees must now commit not to work or must find an employer and give up their refugee status. Some analysts believe that these measures might, however, be counterproductive and encourage criminality or terrorism. They come just after the UN decided to reduce, last October, the monthly food voucher for refugees in Lebanon from 30 to 20 dollars per person.